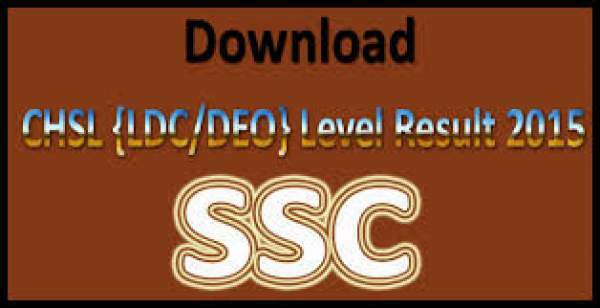 The Staff Selection Commission is an authorized state agency. It will conduct various exams for recruiting suitable candidates for various posts. There are 2049 Lower Division Clerk (LDC), 1006 Data Entry Operator (DEO) and 3523 Postal Assistant (PA/SA) posts. It gives notification to the candidates about the examination to fill these posts. A huge number of candidates applied for the examination. Then Agency successfully conducted the test on 1st, 15th November, and 6th, 22nd December 2015. As all the four phases of written examination are over, the commission is well on its way to check exam scripts. After all the formalities are closed, it will declare a date for SSC CHSL Result 2015. All the candidates successfully give the examination on the particular date and timings as provided by the state Selection Commission. All the candidates took part in the examination are eagerly waiting for the results. About 20 lakhs applicants appeared in the exam. The Commission has released the answer key for the examination in the month of May. The candidates appeared in the examination can check the answer key and can calculate the marks and take the estimation of their marks or can check their performance in the exam. It has been notified to the candidates appeared in the exam that the result of the examination would be declared on 22nd July 2016. The applicants who had written the examination can check the result on the official or main website. The official or main website is www.ssc.nic.in. Applicants who clear the cut off in the written exam will be called for the skill test. The candidates who clear all the rounds will be absorbed into the respective posts. In order to check the result, the candidates must have to follow the steps. The first step is to reach the official website of www.ssc.nic.in. Click on the link ‘Combined Higher Secondary Level Exam Results 2015’. Then enter the details of the candidates such as roll_number, date of birth in the provided fields. Then the result will be displayed on the screen. One can check the result and save it. They can take the printout of the result for future references. Stay tuned to The Reporter Times for latest education news and all exam updates. Don’t forget to share it on social media sites like Facebook, Twitter, Google Plus, and others to let others also know about it.